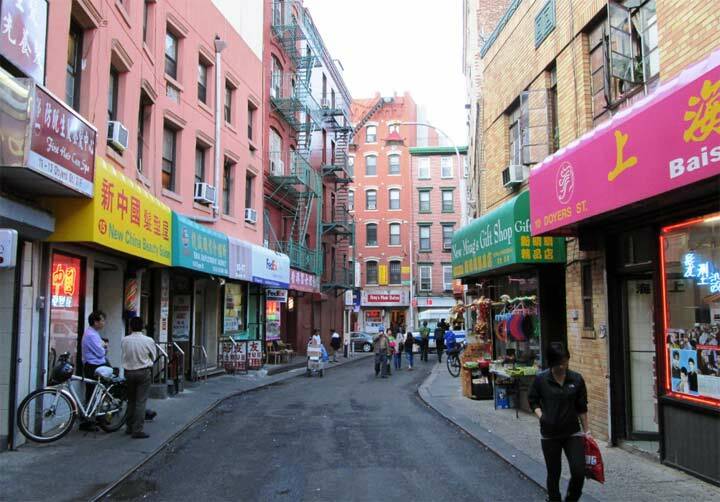 In 2001, a new stretch of Riverside Park was opened between the west end of West 59th Street at a NYC Sanitation depot and West 72nd Street in association with a large apartment house development located atop the former West Side Rail Yards. By 2012, the park had been fully constructed, with a bicycle path, new public piers, and art installations. Initially, ruins of warehouses and piers dotted the edge of the park, but today, just one ruin remains. Here, goods were floated across the Hudson River on railcars located on carfloats to freight yards concentrated along the Hudson River. Pictured is a transfer bridge where those railcars would be connected to tracks that attached to fright tracks running up and down Manhattan’s west side on what was formerly New York Central Railroad. One of the engines that transported the railcars has been preserved in the park and is pictured above. 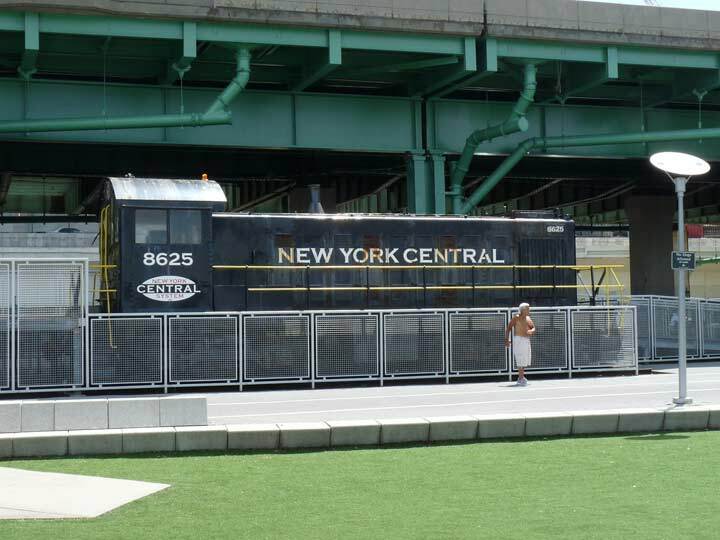 The locomotive is a nice addition, but it’s former Erie Railroad 307, painted as New York Central 8625 in tribute to the West Side Line. As an aside, it’s an Alco S1 built in Schenectady in 1946. 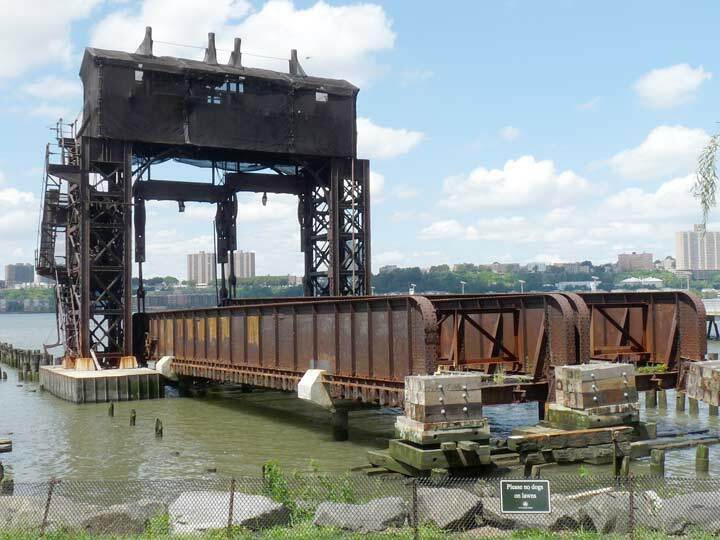 Other former freight transfer bridges can be found in Gantry State Park in Hunters Point, Queens, and in Port Morris in the Bronx, where a park is planned surrounding their location. A working transfer bridge can be found in Bush Terminal in Sunset Park, Brooklyn. Oy. Next time I show one of these things, I’m just going to call it “that thing.” Everyone has their own preference what they should be called. I have been a fan of your site from the start,and I thank you for all the work you put in to it.I notice that a lot of people are quick to correct you on things,let them do the work since they are so perfect,otherwise-SHUT UP!-thank you Gene Quinn. People love to point out errors, perceived or real.